Nautical Friends Play Gym is rated 2.3 out of 5 by 7. 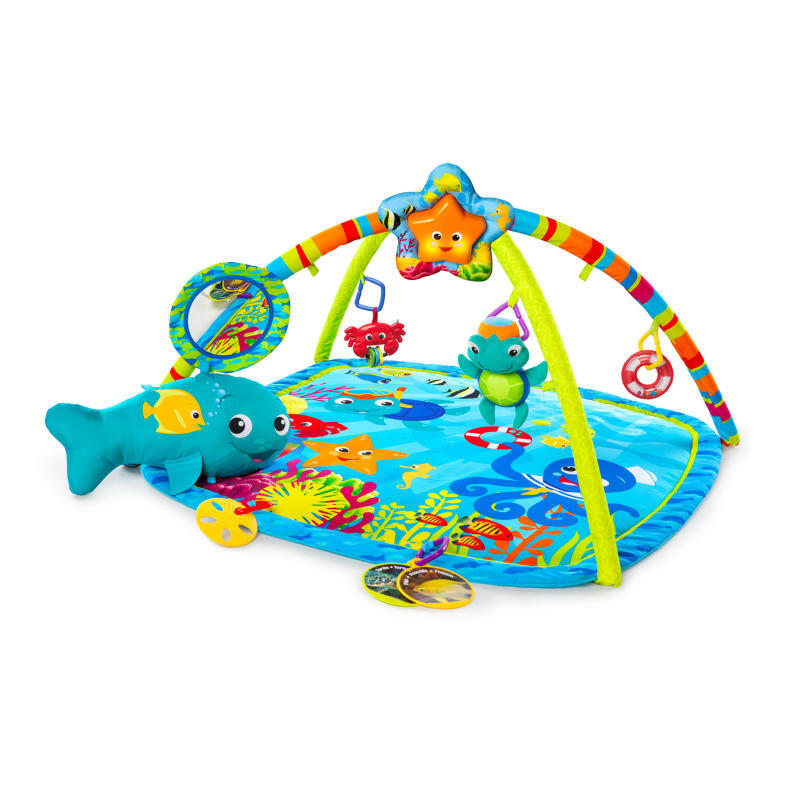 Dimension (in) 35" x 35" x 17"
Rated 1 out of 5 by Michle143 from Needs to be improved I decided to buy this for my son- after my mother had purchased a baby Einstein play gym that my son loved! Now - when I got it - the characters were all the same, but the colors a bit different. The fish was blue and not yellow (no big deal), but the STAR (which seems to be the light up/noise thing) did NOT come with the correct straps. My son can't even see it when he is trying to play on here. Another big complaint is that it was missing an attachment clip to attach the long things to the bottom of the mat. I am so disappointment. He loves all the Baby Einstein characters and such - but he just doesn't play on this play mat for more than 2 minutes. Even the loop placement is poorly designed for a baby to reach. Rated 5 out of 5 by MarkSK from Amazing Product Keeps baby entertained and provides a great learning experience! EXTREMELY EASY to assemble!!! Rated 1 out of 5 by haileyp from beautiful but defective I bought this mat for my 3 month old daughter who sustained a neck injury during birth and has to have physical therapy. She hates tummy time because it hurts her neck and because of that she's behind where she should be. The physical therapist suggested getting a mat that would help support her during tummy time. She loved this one,in fact we had our first successful tummy time on it. the colors helped stimulate her and she loved the star, until it stopped working after about 2 minutes. We took it back to exchange and since we live an hour away from the store we opened the only other one they had and tried the star. Same thing, played for about 2 minutes and then stopped working. It sounds like a skipping record. The store wouldn't give me and percentage off of it for the defective star so we had to settle for something else. I hated it because we both loved it but I can pay $60 for just the mat since the star wont work. It seems obvious that its a defect since two did the exact same thing. Rated 2 out of 5 by Kate123 from Bad instructions poor sensitivity Bought this mat as my sister already had the fisher price rainforest play mat. I am disappointed in contrast. The sensitivity of the motion sensor is really low, also the instructions are very poor It tells me to criss cross the bars but they are parallel in the photos. I would have thought that baby Einstein would have been a lot better than fisher price. I have attached a bell to the Mat myself so that when he kicks he gets a reward. Rated 5 out of 5 by Mona from AMAZING! Just bought this tonight and am so impressed! My 5 month old has been getting so bored and cranky I was at a loss what to do for him. Bought this once I was desperate and wish I had it months ago!! He absolutely loves it and stays happy and entertained for so long!! Rated 1 out of 5 by 1baby from Something is wrong... Just bough this for my baby and the instructions are confusing, they say the bars go across but on the box they go parallel ... What's the correct way? ?